Shotgun metagenomics has become an important tool for investigating the ecology of microorganisms. Underlying these investigations is the assumption that metagenome sequence data accurately estimates the census of microbial populations. Multiple displacement amplification (MDA) of microbial community DNA is often used in cases where it is difficult to obtain enough DNA for sequencing; however, MDA can result in amplification biases that may impact subsequent estimates of population census from metagenome data. Some have posited that pooling replicate MDA reactions negates these biases and restores the accuracy of population analyses. This assumption has not been empirically tested. Using mock viral communities, we examined the influence of pooling on population-scale analyses. 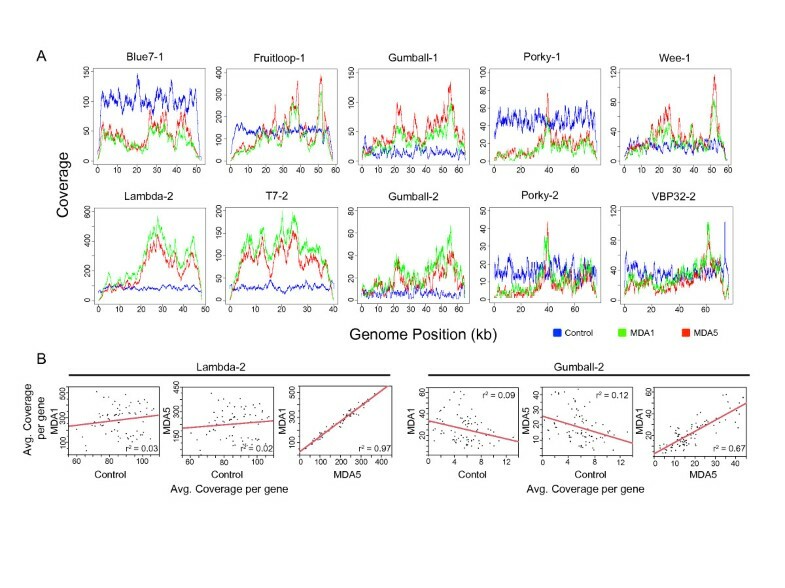 In pooled and single reaction MDA treatments, sequence coverage of viral populations was highly variable and coverage patterns across viral genomes were nearly identical, indicating that initial priming biases were reproducible and that pooling did not alleviate biases. In contrast, control unamplified sequence libraries showed relatively even coverage across phage genomes. MDA should be avoided for metagenomic investigations that require quantitative estimates of microbial taxa and gene functional groups. While MDA is an indispensable technique in applications such as single-cell genomics, amplification biases cannot be overcome by combining replicate MDA reactions. Alternative library preparation techniques should be utilized for quantitative microbial ecology studies utilizing metagenomic sequencing approaches. Metagenomics has revolutionized the field of microbial ecology, providing a culture-independent means of studying the structure and metabolic potential of a microbial community. Obtaining sufficient quantities of high-quality DNA for sequencing is a consistent technical challenge for many metagenomics studies, and is especially the case for studies of viral communities. To circumvent low DNA yields from environmental samples, several amplification methods have emerged, with each method having specific advantages and drawbacks. Linker amplified shotgun library (LASL) procedures require as little as 1 pg of DNA and minimize %GC content amplification bias (≤1.5-fold), but are low throughput . Transposase-based protocols (e.g., Nextera, Illumina Corp., San Diego, CA, USA)  and linear amplification for deep sequencing (LADS)  protocols require slightly greater quantities of DNA (1 to 40 ng), with Nextera being better adapted for high-throughput library preparation, albeit with an acknowledged bias against higher %GC DNA content as compared to linker amplified metagenomes . Multiple displacement amplification (MDA) has been one of the most commonly used means of amplifying environmental genomic DNA (gDNA), especially viral gDNA, prior to the construction of DNA fragment sequencing libraries . This technique utilizes the phi29 DNA polymerase, and is capable of producing long fragments (12 kb average) under isothermal conditions . While MDA provides an easy and effective means of amplifying minute quantities of DNA, biases associated with this technology, including chimera formation, preferential amplification of circular single stranded DNA (ssDNA) and non-uniform amplification of linear genomes, have been documented [7, 8]. Furthermore, the ability to accurately estimate the frequency of individual populations from multiple displacement amplified environmental gDNA has been challenged in controlled experiments . MDA-induced errors in population frequency estimates are believed to arise from preferential amplification of particular genomic regions during initial MDA priming events [10, 11]. Several investigators have proposed that the impact of such preferential amplification on metagenome sequencing can be avoided by pooling several independent MDA reactions run on a single sample of template environmental DNA [12–17]. However, to our knowledge, the assumption that pooling MDA reactions minimizes representational bias in shotgun metagenome sequence libraries has not been thoroughly tested. We constructed two mock viral communities to examine the representational bias of MDA treatments versus an unamplified control sample using circular consensus reads from Single Molecule Real-Time (SMRT) sequencing (Pacific Biosciences (PacBio), Menlo Park, CA, USA). SMRT sequencing was ideally suited to the experiment as DNA amplification is not required in the process of preparing DNA fragment libraries for sequencing, whereas Illumina and 454 pyrosequencing technologies employ bridge amplification and emulsion PCR, respectively. Two mock bacteriophage communities were constructed. These communities were ideally suited to the experiment as the small genome size of phages enabled us to obtain deep sequence coverage with modest levels of sequencing (one PacBio SMRT cell per community treatment). DNA integrity was assessed by running ≥25 ng DNA on a 0.6% agarose gel. Genomic samples with observed degradation products (T4, VBP32 and VBpm10) were purified using gel extraction to isolate large fragments (>48.5 kb) away from smaller DNA fragments. Phage DNA was quantified using the Qubit Quant-iT dsDNA high-sensitivity kit (Invitrogen, Carlsbad, CA, USA) to calculate the amount of DNA to add for each phage during mock community preparation. The first community comprised of nine mycobacteriophage genomes with a similar %GC content of about 63% GC. Genome populations (phage gDNA) occurred at different frequencies in a tiered structure so that the most abundant and least abundant comprised 28.19% and 0.04% of the community, respectively. The second community included eight phage gDNA samples added at equal-genome equivalents and having a range of %GC content from 35.3 to 67.5%. (Additional file 1: Table S1). Three library treatment preparations were performed for each community: an unamplified control, a library constructed from a single MDA treatment (MDA1), and a library constructed from a pool of five replicate MDA reactions (MDA5). For the MDA treatments, six reactions per mock community type (tiered and even) were amplified using the Illustra Genomiphi V2 DNA Amplification kit (GE Healthcare, Pittsburgh, PA, USA). Ten nanograms of gDNA per reaction were amplified according to the manufacturer’s instructions. One MDA treatment for each library was run for 2 hours at 30°C and sequenced individually (MDA1 treatment) while five replicate reactions were run for 1.5 hours at 30°C and then pooled together before library preparation and sequencing (MDA5 treatment). No amplification prior to fragment library construction was performed for the control treatment. One microgram of each DNA treatment (MDA1, MDA5 and control) was prepared for PacBio circular consensus sequencing (CCS) using the 2-kb Template Preparation and Sequencing protocol from Pacific Biosciences. CCS involves the creation of short fragment libraries (500 to 2000 bp) where individual reads are sequenced in multiple passes due to circularization of template molecules using SMRTbell adapters. This allows for the generation of consensus sequences that are higher quality (up to >99% accuracy) than single pass sequences. DNA was fragmented to a target length of 2 kb using Covaris S2 Adaptive Focused Acoustic Disruptor (Covaris, Inc., Woburn, MA, USA) and concentrated using 0.6× volume of Agencourt AMPure XP magnetic beads (Beckman Coulter, Pasadena, CA, USA). Fragmented DNA was end-repaired and SMRTbell adapters were ligated to the blunt ends. SMRTbell templates were purified using 0.6× volume AMPure beads before annealing of the sequencing primer and DNA polymerase. SMRT sequencing was performed at the University of Delaware Sequencing and Genotyping Center using C2/C2 chemistry on a Pacific Biosciences RS sequencer. A total of six samples, consisting of a control, pooled MDA and single MDA sample for each library, were sequenced on separate SMRT cells with 2 × 45 minute movies. Sequence coverage across each phage genome was assessed to examine the potential impact of MDA amplification on the representation of genomic regions of phage within the mock communities. CCS reads greater than 300 bp from each library were recruited to genome reference sequences using CLC Genomics Workbench version 5.5.1 (Cambridge, MA, USA) using the following mapping parameters: mismatch cost 2, insertion cost 3, deletion cost 3, length fraction 0.5, and similarity fraction 0.8. Sequences used in this recruitment experiment are available through NCBI BioProject PRJNA231204. Mapping at lower stringency allowed chimeric reads in the MDA treatment libraries to recruit to their respective reference genomes, with chimeric regions trimmed out before coverage analyses. Unmapped reads were either host genomic contamination (as determined by BLAST analysis) or poorer quality reads. Since longer reads tend to have higher error scores due to fewer sequencing passes, average read length tended to be higher for the unmapped fraction compared to mapped reads. Results of the CCS recruitment for each community are summarized in Additional file 1: Table S2. Read recruitment was also performed at a similarity fraction of 0.95 and length fractions of 0.6 and 0.9, as two of the genomes in Community 1 (Fruitloop and Wee), were similar, with 94.8% similarity over the first 33.1 kb of their genomes. Nevertheless, the resulting genome coverage pattern for phages Fruitloop and Wee remained the same regardless of the similarity and length settings (Additional file 1: Figure S1). Genome coverage at every position in the reference genome for each treatment was calculated using the mpileup function of SAMtools  and graphed using R (version 2.14.0) . Gene coverage for each genome was computed using a custom perl script (Calculation ORF Coverage, http://sourceforge.net/projects/calculationorfcoverage/). Comparison of gene coverage between treatments by performing pairwise t-tests and Pearson’s correlation coefficient was computed using JMP statistical software (version 9.0.0; SAS, Cary, NC, USA). The PacBio sequencing technology is particularly sensitive to DNA quality as input DNA is sequenced directly with no prior PCR amplification or cloning steps . The performance of MDA is also dependent on input DNA quality. In a heterogenous mixture of DNA, degraded gDNA will have fewer amplification branches during MDA leading to unbalanced amplification of viral community members [21–23]. Since mock communities were constructed from phage gDNA isolated by multiple laboratories using different DNA extraction techniques and storage conditions, the DNA quality of each viral genome in the mock community was variable. Six of the 15 phage genomes were covered poorly. In the case of the tiered community (Community 1), phages Catera, Angelica and Solon had low coverage because they were designed to be rare members within the mock community. Other phages (T4, VBpm10 and Athena) were poorly covered due to either unknown issues in the sequencing pipeline or possibly poor quality of input phage gDNA. In control mock communities, phages T4, VBpm10 and Athena had lower coverage than expected, likely due to poor DNA quality. Removal of smaller degradation products was attempted for T4 and VBpm10 using gel extraction, but this was likely unsuccessful. Because these three genomes sequenced poorly, the resulting rank genome distribution of phages within the metagenome library did not match the predicted mock community structure. However, the majority of phage genomes in the experiments (five genomes from each community) had sufficient sequencing coverage, and thus it was possible to examine the potential influence of MDA on representation of phage genomic regions (Additional file 1: Table S1). Coverage patterns across each genome in both the pooled and single MDA treatments displayed a striking similarity to one another, and differed from the control treatments that tended to have relatively even coverage across the genomes (Figure 1A). In most cases, the coverage plots for the MDA1 and MDA5 treatments were highly similar. In agreement with this observation, genomes from the MDA treated libraries had a greater standard deviation of coverage as compared with genomes in the control treatment (Table 1). This was particularly evident for phage Fruitloop. While average coverage of the Fruitloop genome was similar across treatments, the standard deviation was roughly three times greater in MDA treatments compared to control. Pairwise comparison of average sequence coverage per gene in the treatments indicated a high correlation between MDA treatments (P < 0.0001) but not between the MDA treatments and the control. The r2 values of the linear regressions ranged from 0.67 to 0.97 (correlation coefficient values of 0.79 to 0.99) in comparisons of average sequence coverage per gene in the MDA1 and MDA5 treatments (Figure 1B, Table 2). Similar comparisons for the control versus MDA1 treatments or control versus MDA5 treatments yielded r2 ranges of 0.01 to 0.17 and 0.001 to 0.31, respectively. Interestingly, mycobacteriophages Gumball and Porky, included in both mock communities, had similar gene coverage patterns when compared across treatments (Figure 1A, Table 2) and across communities (Table 3). This suggests that the composition of the mock community did not influence resulting genome coverage patterns, and that MDA biases were likely sequence-dependent. Sequence coverage of mock viral community genomes from control and multiple displacement amplification treatments. (A) Depth of coverage across the length of the genome for community members from control and multiple displacement amplification (MDA) treatments. The blue plot represents genome coverage for the control community, the green plot represents genome coverage for the single MDA treatment (MDA1), and the red plot represents genome coverage for the pooled MDA treatment (MDA5). −1 and −2 indicates mock community 1 and mock community 2, respectively. (B) Linear regression of pairwise comparison of gene coverage between control, MDA1 and MDA5 treatments for Lambda-2 and Gumball-2. Each point represents a single gene. *-1, -2 indicates data from community one and community two, respectively. †Predicted read abundances were recalculated to take into account the low recruitment of phage Athena, T4 and VBpm10. CCS, circular consensus sequencing; MDA, multiple displacement amplification. Comparisons were of average coverage for each predicted gene in a genome. †P < 0.05. ‡P < 0.0001. MDA, multiple displacement amplification. Comparisons were of average coverage for each predicted gene in a genome. Coverage bias in the MDA treatments occurred towards the middle of the genome for several phages (Blue7, Porky, Wee, lambda, Fruitloop, T7, and Gumball) relative to the ends of the genome (Figure 1A). The bias towards the middle is understandable as MDA priming events producing fragments of sufficient length for sequencing would likely have proceeded towards the middle of the linear genome thus leading to an over-representation of DNA (and subsequently sequence reads) in the middle of the phage genome. A few genomes also showed coverage peaks within 10 kb of one or both ends (lambda, Blue7, VBP32, Wee, Gumball, and Fruitloop). These peaks are difficult to explain, but may have resulted from a bias in the priming efficiency of subsets of the random hexamers used in priming the MDA reaction [24, 25]. Five to 1,140 bp were missing from genome termini in both MDA treatments, with the notable exception of Gumball and VBP32 which have terminally redundant genomes. This phenomena of missing bases at the ends of linear genomes has been reported before in the sequencing of chromosomal ends [22, 26, 27] and is likely the result of DNA fragments becoming progressively shorter as priming events near the terminal end of a genome. Subsequently these short fragments are lost during library construction or filtered out in bioinformatic processing and longer fragments containing the ends are rare within the sequence library. An important aim of metagenomics is to assess the frequency of taxa and gene functions within natural microbial communities through DNA sequence data. The rigor of these assessments rests on how well the frequency of a sequence within a metagenome library reflects the frequency of its originating microbial population within the community. These data indicate that the frequency of sequence reads from a viral community gDNA sample amplified using MDA does not accurately reflect the true frequency of taxa or gene functions among viral populations within the original sample. MDA clearly caused certain regions of the phage genomes to be over-represented in the resulting sequence library. Counter to current thinking, pooling of several MDA reactions did not alleviate this bias as coverage patterns within genomes were recurrent across experiments and reactions. The most parsimonious explanation for this phenomenon is that the random hexamers used for priming the MDA reaction did not in fact prime randomly across all genomes. The consequence of unequal priming efficiency of MDA was that subsets of genes from a given viral genome were artificially over- or under-represented within the resulting metagenome sequence library. Many viral genomes, especially phage genomes, have a modular genetic organization with genes clustered according to their functional roles such as head assembly, tail assembly and genome replication . Because the middle portions of linear phage genomes tended to be over-represented, genes within these regions would also be over-represented within the library relative to their true abundance within the genomes. Many phages have similar functions located at similar locations in their genomes, such as the λ supergroup within the siphoviridae family . At the community scale, inaccuracies in the frequency of gene functional groups caused by MDA could be linked with the typical position of a given functional gene group within a phage genome. It should also be noted that non-uniform coverage could hamper assembly-based community analyses that strive to assemble genome-length fragments from a complex mixture of multiple genotypes [30, 31]. Considerable effort has been focused on evaluating and optimizing methods for metagenomic library construction. LASL is a commonly utilized alternative to MDA for preparing metagenomic libraries [1, 4, 32, 33]. While starting DNA quantities as low as 1 pg have been successfully prepared for Illumina sequencing using the LASL, such low starting amounts of DNA require more PCR cycles to generate sufficient DNA for sequencing. As a consequence, sequences at the extremes of %GC content can be under-represented. At greater initial DNA quantities (10 to 100 ng), fewer PCR cycles are needed leading to a smaller degree of %GC bias . Initial analyses of a relatively new technique, known as LADS, indicate that LADS libraries produced more uniform coverage than PCR-based library preparations across low and high %GC genome regions . However, the LADS procedure has been found to generate a greater number of duplicate and chimeric reads as compared to standard Illumina library protocols . More research is needed to evaluate the performance of LADS for metagenomic investigations. Transposase-based Nextera™ kits have been increasingly utilized in the construction of metagenomic fragment libraries for Illumina sequencing. While better suited to high-throughput sample preparation, Nextera also suffers from %GC biases linked to the PCR step and a slight bias in sequence targeting by the transposase during DNA fragmentation [2, 4, 35]. Despite the documented biases of the LASL and Nextera protocols, the degree of bias in these techniques is substantially lower than that of MDA protocols [9, 33, 36]. In theory, any amount of amplification has the potential to skew the ambient distribution of mixed community DNA. Therefore, an optimal library preparation would require no amplification steps. PCR-free protocols are available, but the large amount of input DNA needed for such procedures can be prohibitive for ecological studies . The advent of new sequencing technologies coupled with new protocols to prepare DNA for sequencing are paving the way for future methodologies that may exclude any type of amplification. Library preparation methods that require as little as 1 ng DNA have been demonstrated for PacBio SMRT sequencing . With continuing development, such methodologies hold promise for removing amplification bias from metagenomic investigations. Our findings contribute to the growing evidence that MDA should not be utilized in metagenomic studies seeking quantitative information on the population structure of a microbial community. MDA has been an invaluable tool in several important areas of research, including single cell genomics and forensics [7, 32, 33, 39]. The efficient amplification of circular ssDNA templates during MDA has been exploited to explore the diversity of ssDNA viruses [40–43]. Within microbiome research, MDA protocols are an easy means of obtaining sufficient DNA for next generation sequencing; however, subsequent observations of microbial taxa and gene functions within metagenome libraries are not quantitative. The practice of pooling replicate MDA reactions from a single sample does not alleviate biases in the representation of sequences within a library. Researchers should carefully evaluate their requirements for quantitative data on the frequency of microbial taxa and gene functions before utilizing MDA in a microbiome investigation. This work was supported through grants to KEW and SWP from the National Science Foundation (MCB-0731916 and OCE-1148118) and the Gordon and Betty Moore Foundation. RM was supported through a graduate fellowship from the University of Delaware Institute for Soil and Environmental Quality. CM and VV were supported through undergraduate research funding from the Delaware NSF EPSCoR program. Computational infrastructure support provided by the University of Delaware Center for Bioinformatics and Computational Biology (CBCB) Core Facility was made possible through funding from the NIH NIGMS (8P20GM103446-12), and NSF EPSCoR (EPS-081425). The authors are grateful to Bruce Kingham and Olga Shevchenko of the University of Delaware Sequencing and Genotyping Facility for sequencing support. We thank Helen Donis-Keller, Daniel Russell, Erica Sims, Graham Hatfull, and Bo Zhang for providing mycobacteriophage DNAs; and William Wilson and Ilana Gilg for providing vibriophage DNA. RM carried out the design and constructed the mock viral communities, analyzed sequencing data, performed statistical analyses and drafted the manuscript. CM and VV participated in construction of the mock viral communities and sequencing analysis. DN and EC participated in the bioinformatic analyses. SWP and KEW were involved in the design of the experiment and the drafting of the manuscript. All authors read and approved the final manuscript.